A major project to find Chalara-resistant ash trees has been announced by Environment Secretary Owen Paterson. The £1.5 million project is part of the latest Chalara Management Plan published today, and will see a quarter of a million young ash trees planted in up to 25 sites. These sites will mainly be in East Anglia as this is the area with the most cases of Chalara and the young trees will be exposed and monitored in the search for resistance. “We know we can’t stop Chalara infecting our ash trees so we have to throw our resources into managing it and slowing the spread. A key part of that strategy will be identifying those trees which have a natural resistance to the disease so that we can re-stock our woodlands in the future. “This project of monitoring 250,000 young ash trees is unprecedented in its scope. The UK is leading the way internationally on trying to identify resistant strains. “However this is not the whole story. In tandem with this project, we are also commissioning research to investigate genetic resistance in a laboratory setting. The project, which is believed to be the first of its kind and scale in Europe, will use existing stocks of ash saplings which will be bought by Government and planted in the East and South East of the country. 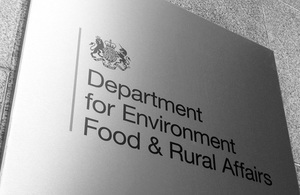 Defra scientists and the Forestry Commission will work with local landowners to monitor the trees for signs of Chalara, paying particular attention to saplings which show resistance to the disease. The threat from a range of pests and diseases has increased over the last decade and shows no sign of decelerating. This is one of the reasons that Environment Secretary Owen Paterson has put tree and plant health as one of Defra’s four key priorities, alongside animal health, improving the environment and growing the rural economy. Work carried out by Cambridge University supported the likelihood from the Autumn that Chalara is an airborne disease which has blown across from the continent. It therefore concludes that it is impossible to prevent the disease spreading across the country. Continuing to monitor signs of Chalara in established woods and forests. That is why from April landowners will be able to apply for grants to plant other trees in areas where they would once have planted ash. Owners of woodland in areas of the country with lower levels of Chalara will be able to access funding to help them remove any infected ash saplings to help to slow the spread of Chalara and replant with alternative trees. In the meantime, the process to evaluate the possible usefulness of various chemical treatments against Chalara, submitted by a number of producers, has reached a new stage. Fourteen of the treatments that have been submitted for scientific analysis are being taken forward for laboratory testing. These are a mixture of products which may be effective on live trees and those which may be effective on leaf litter. These products need to be tested to ensure they do not adversely affect other wildlife or human health and investigated as to how they might be used. In consultation with the various woodland groups involved in developing it, the new plan has continued the ongoing process of addressing these issues. This ongoing work is in addition to and complementary to the report from the Plant and Tree Health Independent Task Force, chaired by Professor Chris Gilligan, which is being published later in the Spring. The report will look at tree and plant health overall and make recommendations on how we can best protect our forests and woodlands against a variety of tree pests and diseases. The £1.5million of money into research for genetic resistance announced today is in addition to the £8 million the Government has already allocated for research into various pests and diseases which could affect our trees.